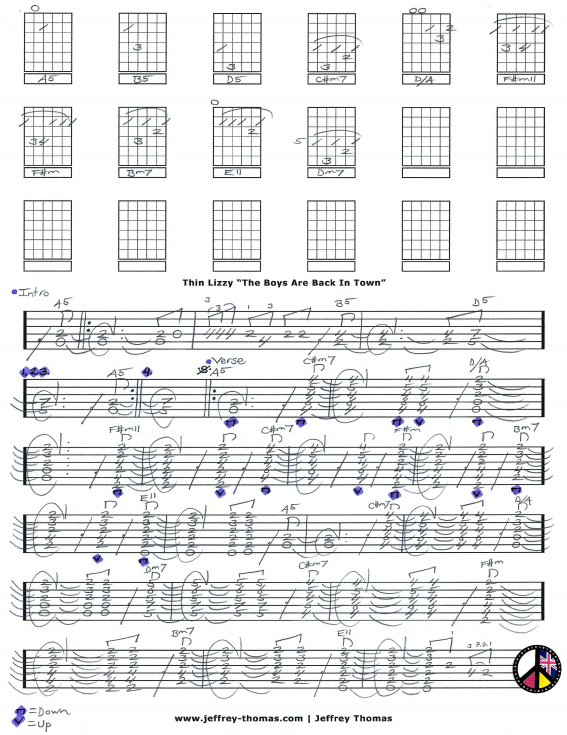 Thin Lizzy The Boys Are Back In Town Free Guitar Tab by Jeffrey Thomas. Here it is! I have a great guitar tab arranged for one guitar with all the right chords, rhythm, melodies and fills. This is a perfect version for a single guitarist. Learn all the great rhythm and lead guitar work from the original studio version. This is one of the most popular songs by Thin Lizzy and my free guitar tab will show you how to play it right. Want the full guitar tab for free? Just send in your email through the form here on the page and I’ll send it to you. If you would like to learn how to play this song fill out the Schedule A Free Lesson form to set up a free Skype guitar lesson. “The Boys Are Back In Town” place 499th for this Irish rock band on Rolling Stones 500 Greatest All Time Songs. Find more great online guitar tabs on my tab, video and blog pages.